When Rasmus Malling-Hansen wrote letters on his writing ball, he sometimes was in need of making several copies of his letters, and as always the brilliant mind of Malling-Hansen wanted to find a way of making several copies in one process, in stead of the usual way - to use carbonized paper and make one extra copy at the time. 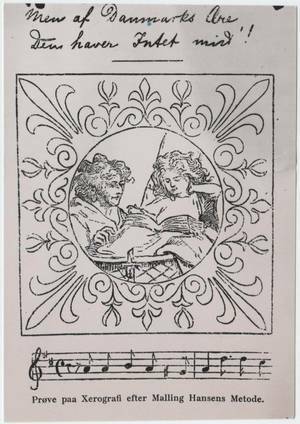 In 1872 he invented the first known dry copying method, and he called it the Xerografi, the same name that several years later was used by the famous company. But the Malling-Hansen copying method has only got the name in common with the much later photocopying process. Malling-Hansen used oiled paper, and he placed the carbonized paper underneath the paper with the carbonized side turned upwards, and this way it was made a reverse imprint of the writing on the backside of the oiled paper. He wrote on 5 pairs of these papers at the time, and this way he had 5 "negatives" when he had finished writing. He then put white sheets of paper between the reverse imprints and then rolled them twice through a satiner machine, and thus he had in a very short amount of time, made 5 copies. The oiled paper could be used up to 20 times, and in only ten minutes or so, he was able to make 100 copies of a letter. Malling-Hansen experimented a lot with his method, using carbonized paper from different producers, and he soon discovered the unique qualities of the blue colour, called "Berliner Blau" - when using blue carbonized paper, he could make far more copies than with any other colour. He also tried to add different types of liquids to the imprint made on the oiled paper, and he found out that if he added water with a solution of soap, he did not need the relatively expensive satiner machine, but could use an ordinary paper press, which was much cheaper, and which most people who used an inkpen already had in their homes. 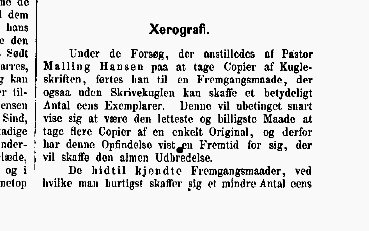 The inventor Malling-Hansen always thought about the practical issues in connection to his inventions, and so also with his dry copying method - the Xerografi. During Pastor Malling Hansens experiments with taking copies of the ball-print, he was lead to a method, which, also without the Writing Ball, can produce a significant number of identical copies. This will undoubtedly soon prove to be the easiest and cheapest way to make several copies from one single original, and therefore this invention has probably a future ahead, which will make it very popular. The present methods, by which one can quickly acquire a small number of identical copies, are limited to these two: On a piece of paper printed with copy ink is placed a piece of moistened translucent paper and both pieces are then squeezed in a copy press against each other, where by the print is printed on the underside of the translucent paper. Thus you have two identical copies and can, by once more printing of the original on translucent paper, get a third, but usually very blurred copy. With the other method, which is particularly used in telegraph stations, a piece of paper is laid on a hard surface and on top of it a piece of ink paper with the coloured side downwards; on the ink paper is again laid a piece of writing paper and so on in 4 to 6 layers. With a hard pencil or an Agate-point (?) and under a somewhat hard pressure, one writes through all these layers, and thus gets so many identical copies as there is layers, generally not more than 6, if you use ordinary paper, but around 12, when you use silk paper. The new method has, as its first step, some likeliness to the last mentioned method. Blue ink paper and 'writing through' is used. But instead of putting the writing paper in the bottom, and upon it the ink paper with the colour downwards, then the ink paper is laid at the bottom, with the colour upwards, and on top of it a sheet of oil paper, then ink paper with the colour upwards, then oil paper, ink paper and so on, eg in 5 layers. These layers are written through, and you have thus 5 identical copies, on which the printing or the drawing is in reverse on that side of the sheets of paper which was downward during the printing. From each of these 5 copies can now be made not less than 20 reprints, giving 100 copies plus the 5 originals, in the following way: Between the 5 copies is laid writing paper, and this stack is passed through, under not too heavy pressure, the two rollers of a small Satineer machine. The writing will then be printed on the 5 sheets of writing paper. Once more, 5 pieces of writing paper is placed between the already once used originals, and again they are passed through the rollers, but under a slightly heavier pressure, and now you have 10 copies. This printing can - with a constantly growing pressure of the rollers - indeed be repeated not less than 20 times, and all 100 copies can be produced in 6 or 7 minutes, and they are all clear and sharp, yes even the writing on the 5 originals stand very clear and clean, in spite of the fact that there, from their original colour, has been taken colour to 20 other copies. If you write through 10 originals in one time, you can make 200 identical copies in 10 minutes. 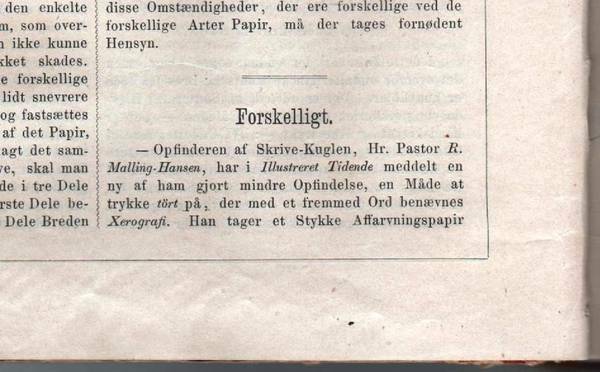 The new idea in this method rests on the lucky discovery which Pastor Malling Hansen made some time ago, that the writing from the mentioned blue ink paper u n d e r c e r t a i n c o n d i t i o n s can be printed many times without loosing its colour. The colour from black or brown or other kinds of ink paper only gives a few useable prints, whereas the blue paper, if it is of the very intensive colour called Berliner Blue, alone is capable of giving the surprisingly high number of prints. Of the suggested conditions the following are the most important: The ink paper must be thin and the colour on it must be finely grinded, preferably much finer than the colour you usually buy. Next, the oil paper must be thin, hard and very dry; that the paper is saturated with oil and that it is hard and dry has the effect, that it can take up the colour from the ink paper without absorbing it, and is thus able to give it off again. Furthermore the writing paper, i.e. the paper that the copies are printed on, must not be striped or ribbed but even, but without being too smooth. Finally the first print must be made with the least possible pressure of the rollers of the Satineer machine, and the following prints under a little stronger pressure than the previous. Furthermore it must be underlined, that while the job of the Satineer machine has, until now, only been to smoothen or glaze paper, then it now gets a new utilization, namely to produce dry prints, - where neither the book press, nor the copy press nor the lithographic press are as usable as the Satineer machine. For the writing through, instead of a pencil or an agate-point, a small, flexible ivory stick is more usable or, when you only want 20 identical copies, and thus only need one original, an ordinary pen dipped in ink. 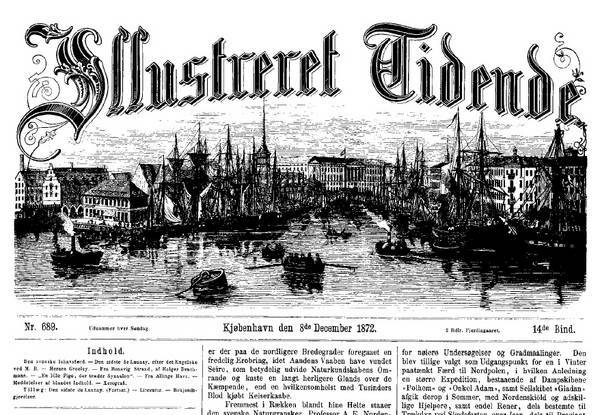 A new method should preferably have a new name, and it lies close, that the inventor has called the here described dry print - Tør Tryk (Dry Print) or Xerografi. Since one here uses writing paper for the prints and oil paper for the originals and since the writing stands in reverse on the oil paper, which - oil paper and reverse writing - otherwise belongs to the hitherto usual copying methods, then the new in this method has been clearly and not unwittingly described by the following statement by professor Holten: "Hitherto one has first written the originals and then taken the copies. Now one will make the copies first and then the originals afterwards." While thus the former copying methods have only yielded from 2 to 12 identical copies, then the Xerografi can, in the same amount of time with only a few minutes extra, deliver a c o u p l e o f h u n d r e d identical copies, and this, when first the Satineer machine has been acquired, without any other cost than for the paper. In comparison with the Autografi (?) 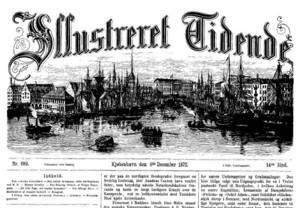 or the lithographic overprint (?) the xerografi, when there is no need for a number of copies larger than around 200, again gets the advantage, due to its much greater speed and cheapness. and in particularly due to the fact, that one does not have to send what one has written out of the house, to get many copies, but can oneself and with great ease make the prints. Xerografi is thus now the simplest, fastest and cheapest means to get many identical copies. 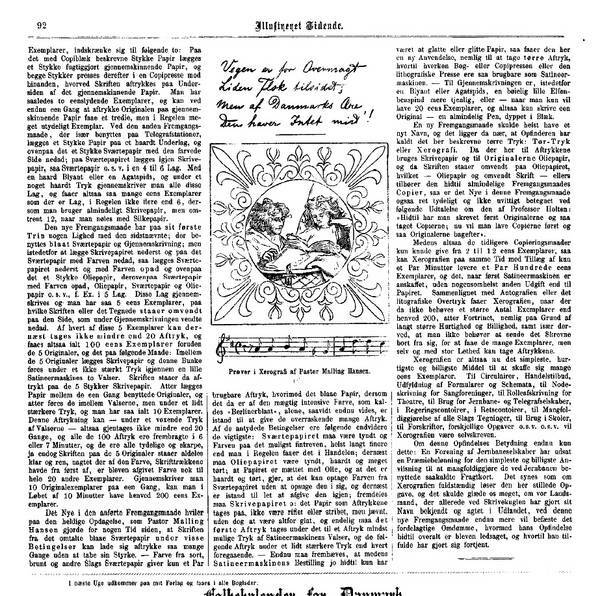 For circulars, trade offerings, filling out of formula and schemes, note-writing for singing clubs, role-descriptions in theatres, for railway and telegraph companies, in government offices, in court offices, for multiplication of all kinds of drawings, for use in schools, for instructions, different tasks, a.s.o. a.s.o. Xerografi will be obvious. A federation of railway companies has promised a prize for the simplest and cheapest method to multiply the freight cards used by the railways. It seems, that the Xerografi completely solves this task, and it should give us great joy, if our fellow countryman, who already with the Writing Ball has made his name well-known and respected abroad, by this new method will even more confirm the advantageous reputation, which everywhere has accompanied his invention, and which he has so fully deserved. 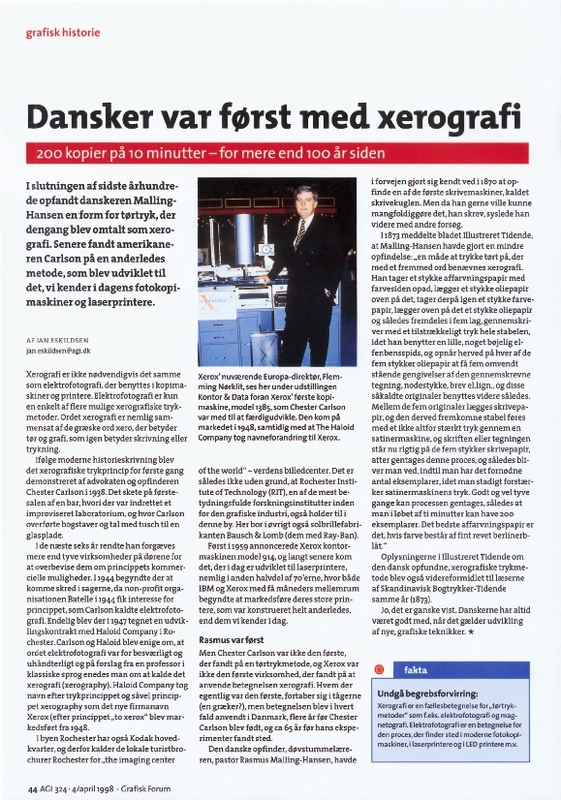 Denne artikkelen fra Aktuel Grafisk Information, 1998, da AGI hadde et tema om utstillingen Grafisk Forum, er gjengitt med tillatelse fra forfatteren, Jan Eskildsen. 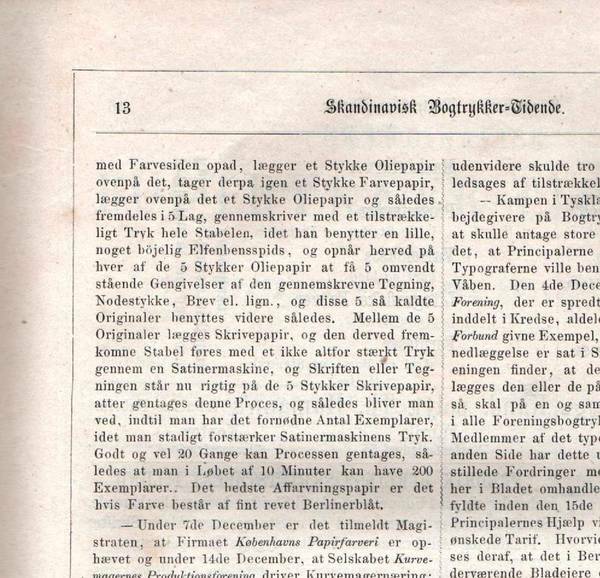 Under ses presentasjonen av Malling-Hansens oppfinnelse fra Skandinavisk Bogtrykker-Tidende i 1873, utgitt av industrihistorikeren Camillus Nyrop, som også skrev om Malling-Hansens oppfinnelser i Illustreret Tidende.